Oconto Falls Municipal Utilities is a municipally owned and operated electric, water, and wastewater utility, serving more than 1,600 customers in Oconto Falls, Wisconsin. We strive to provide low-cost, reliable service with a community-focused, personal touch. We are your friends and neighbors who share your values and understand your needs. Oconto Falls Municipal Utilities was founded in 1932. While a lot has changed over the past century, the focus of the utility has not. Today, we still offer our customers some of the lowest electric rates in the area - rates significantly lower than those in territories that are served by most investor-owned utilities. 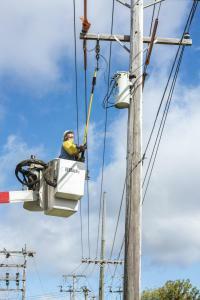 And, since we live and work in the community, we provide reliable energy with superior customer service. Oconto Falls Municipal Utilities also provides our customers with clean, high-quality water that meets or exceeds all state and federal standards. Our water quality and capacity are monitored every day by well-trained system operators.